26 | May | 2009 | Oscars in Order With Recipes! I think the Academy felt guilty about snubbing Ron Howard’s superior Apollo 13 back in 1995 and that’s why they voted A Beautiful Mind as being 2001’s best. Not that A Beautiful Mind is bad, it’s just not that great. It sort of reminded me of one of those 1930-1940’s MGM melodramas where no one believes Greer Garson could discover radiation and she ages or no one believes Jennifer Jones sees visions or Irene Dune conquers rustic Oklahoma and ages. This time Russell Crowe (as John Nash)discovers some complicated theory whilst going a bit schizoid and ultimately (after aging) wins the Nobel prize. And Jennifer Connelly gets to be supportive and impossibly beautiful. This movie made me feel like 1994’s Teen Talk Barbie (“Math is Hard”) because I didn’t understand what John Nash’s theories were all about and all the scratches he left on the windows left me scratching my head. The movie is a bit slow but just like Ms. Connelly it’s very pretty to watch. Princeton University looks amazing. Othe films nominated that year: Moulin Rouge (oh, how I wish this one had been picked it’s such a favorite of ours), The first of the Lord of the Rings trilogy of terror (I’m dreading 2003, I really am. I just don’t get all that Middle Earth stuff) Gosford Park (that’s a good one, too. And they should have thrown one Altman’s way; now it’s too late) and In the Bedroom (meh). Add the mushrooms and the sliced onion to the spinach and toss. Add the dressing and bacon and toss to combine. Divide the spinach between 4 plates or bowls . Season with pepper, as desired. Serve immediately. Sauté onions in frying pan with olive oil. Add celery and carrots. Add ground meat and marinara sauce and cook in frying pan for about 15 minutes. Cook gnocchi separately in boiling water for 6 minutes. Stir constantly. When gnocchi rises above water, they are done. Drain water. 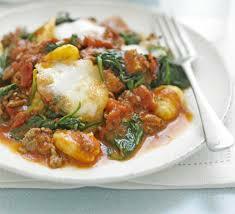 Combine gnocchi with meat/ marinara mixture and add Parmesan cheese, basil, and a touch of salt and pepper. You are currently browsing the Oscars in Order With Recipes! blog archives for the day Tuesday, May 26th, 2009.